A view on the Shinbashi (also Shimbashi) bridge and Ginza avenue in Tokyo by Kozaburo Tamamura (1856-19?? ), sometime between 1882 and 1899. 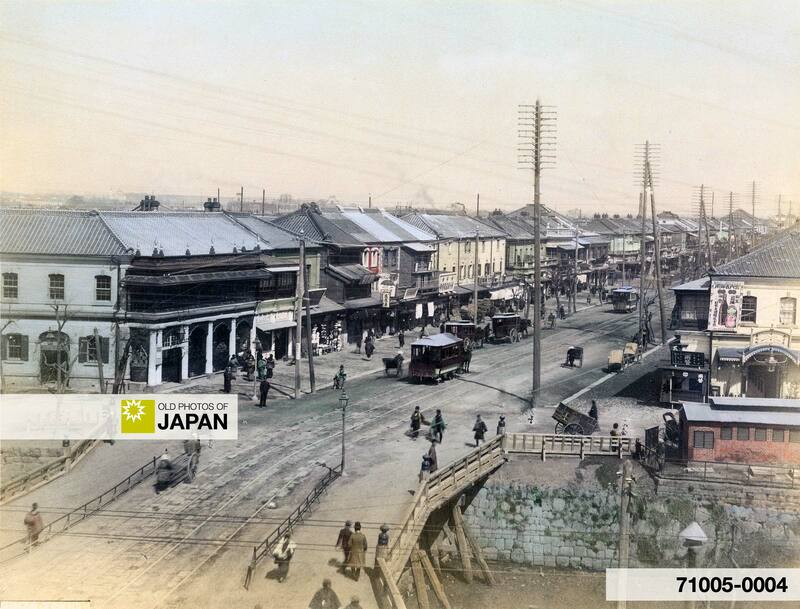 The wooden bridge over the Shiodomegawa (Shiodome River) was replaced with an iron bridge in April 1899. Streetcars have already appeared on this image, but are still drawn by horses. Tokyo’s horse-drawn streetcars started operations on June 25, 1882. On August 22, 1903, the streetcars were electrified. By the following year, horse-drawn streetcars disappeared from the streets. Along the road several carts are parked. In addition to streetcars, jinrikisha (rickshaws) and horse drawn carriages can be seen. The horse drawn carriage service started in 1872 and connected Shinbashi with Asakusa. The corner building on the right appears to have a sign advertising billiards (watch a rare 1929 video clip of Japanese women playing billiards). The billboard next to the window advertises Yebisu Beer and reads, “Nihon Brewery Co., Purveyor to the Imperial Household Agency.” Japan’s very first beer hall, Yebisu Beer Hall was opened here on August 4, 1899. It was an enormous success and soon Ginza counted many beer halls. The building in the left front is believed to be Chitose Restaurant, which was owned by Matsukawa Choemon. In October 1899, the Teikoku Hakuhin-kan Kankoba (current Hakuhinkan) was established here, a proto-type department store. The origins of the name Ginza date back to 1612 when a silver-coin mint (Ginza in Japanese) was built in the area. The area was called Shinryogae-cho (new money exchange district) because of the many money exchange houses located here. It didn’t take long for the people to name the area after the mint. 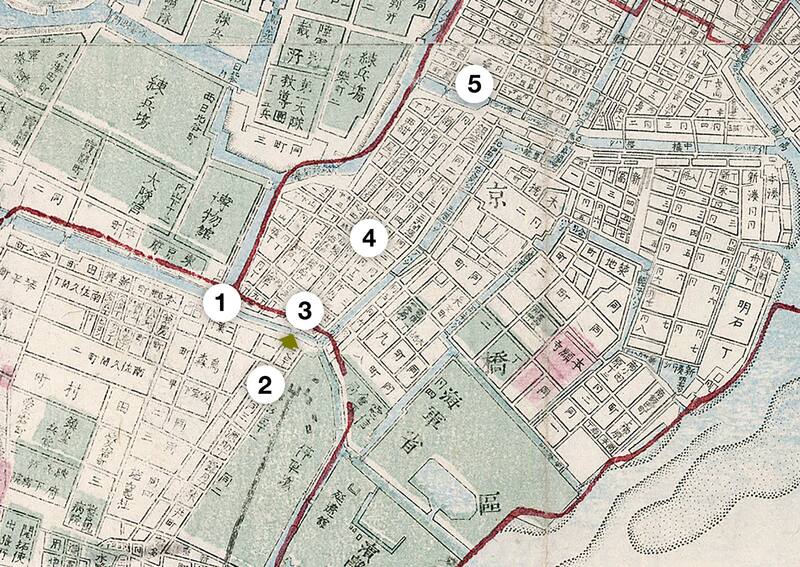 Ginza finally became the area’s official name in 1869 (Meiji 2). The newly minted Ginza was virtually destroyed in 1872 when a fire raged through the area consuming the wooden houses and shops. The disaster prompted Tokyo Prefectural Government to build more lasting structures and they contracted Irish born architect Thomas J. Waters to design Western style buildings. He produced a large number of Georgian brick buildings, two and three stories high. Gas lights, the first in Japan, were installed in 1874 (Meiji 7). Later, Japan’s first electric street lights were also installed in Ginza. When Ginza Bricktown was completed in 1877 (Meiji 10), the area between the Shinbashi bridge and the Kyobashi bridge had been completely transformed and became Tokyo’s trendiest shopping avenue. Thanks to its convenient location near the business districts of Nihonbashi and Kyobashi, the area soon attracted newspaper companies and the printing industry, making it Japan’s information center. Many new ideas were either born or spread from here. Cosmetic power house Shiseido started life as a Ginza pharmacy in 1872. Famed watchmaker Seiko Corporation was born here when founder Kintaro Hattori opened a clock store along Ginza avenue in 1881. As mentioned above, Japan’s first beer hall, Ebisu, was established here in 1899, as well as the trendy new cafés Printemps (1911) and Paulista (1902). The world’s first store specializing in cultured pearls was opened here in 1906 by Kokichi Mikimoto. The Great Kanto Earthquake of September 1, 1923 hit Ginza hard and once again the area was almost completely destroyed. This prompted new plans for the area which made it even more popular and fashionable. It was once again partly destroyed by the US firebombing of 1945, but rose from the ashes stronger than ever. Ginza now boasts the most expensive real estate in Japan. The Mainichi Shimbun reported on August 2, 2007 that the area in front of the Kyukyodo stationery shop was valued at 24.96 million yen (approx. 223,400 US dollars) per square meter. A piece of land as small as a postcard cost a whopping 369,000 yen (3,300 US dollars). It was the 22nd year in a row that the area was Japan’s most expensive spot. In 2017, Japan’s National Tax Agency valued the area in front of Kyukyodo at 40.32 million yen per square meter, or approximately 359,339 US dollars. You can also licence this image online: 71005-0004 @ MeijiShowa.com.